In March of 2010, Deborah Hay performed her first solo in six years at Dancespace Project in New York City. This piece, No Time To Fly, became the foundation of a number of subsequent works. In early 2011, Bill Forsythe’s Motion Bank invited the performers Jeanine Durning, Juliette Mapp and Ros Warby to adapt this score — first as an individual solo and then into a new trio. This new piece, now called As Holy Sites Go was performed in 2012 at Motion Bank’s Frankfurt Lab. The trio adaptation of As Holy Sites Go, has been adapted yet again, but now as a duet, by two of the original performers, Ros and Jeanine. The digital score of the Motion Bank process, was set by Deborah on the twenty-one dancers of Cullberg Ballet in a new iteration called Figure A Sea. Both of these new works make up this weekend’s program. The process of this series of adaptations (which encompassed both live performance and digital transcription/performance), is documented on the Motion Bank website, and two of the resulting films are being shown on the large screens in front of the courtyard. The evolution of this score, from the printed word though many modalities of performance and point of view is a sublime portrait of how bodies compose themselves. The written score of No Time To Fly reads like a prose poem, with interjections of notes, drawings, footnotes, instructions. It is a way of capturing space, and then presenting that space for others to capture, or re-capture, depending on your point of view. 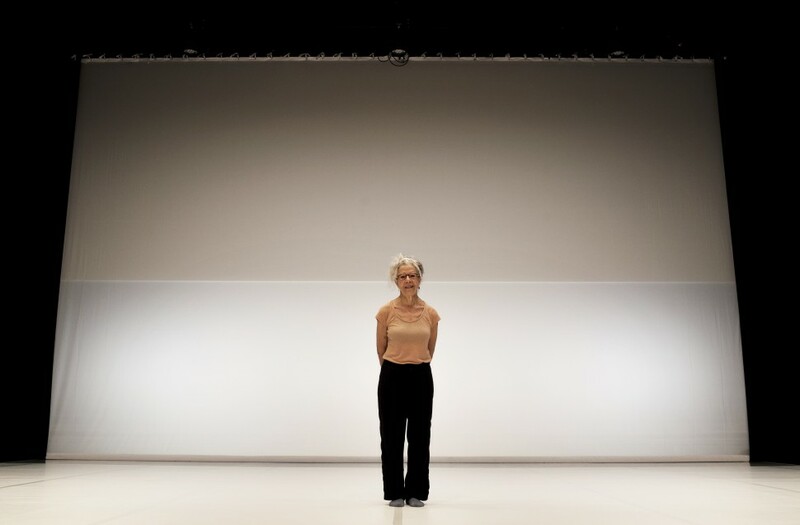 Deborah’s works have been described as being “more like rituals than concerts,” her scores give dancers an individual agency that is not as prevalent in more traditional choreography. Note: My head is free to look down or away or to turn. It is not fixed. Note: There is no repetition in live performance. Note: I neither hurry nor linger. We also struggled with how much to reveal of the questions and the score before the lights dim and the dance begins. In the end, our wonder and fascination with the score and all it offers won the day. We couldn’t help but share some of it with you: not so that it would provide you with answers, but so that it might encourage you to consider your own questions.